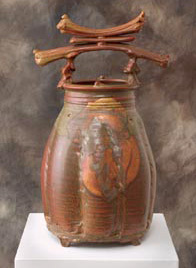 I have been making pottery since 1969 when I stumbled into the ceramics studio at the University of Maryland. As a product of the 60's, I was intrigued as much by the medium as by the prospect of an alternate lifestyle. Almost immediately, the studio became my home, and by the end of that first year, I determined to pursue pots as my life's work. The dynamic quality of wheel work made me a thrower, and functional clay became my focus. I loved the idea of pots for use-that something I made might become part of someone's everyday life. Over the last 30+ years, I have also worked with larger, decorative pieces, exploring the very different statement that size can make. 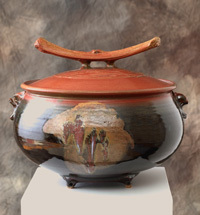 All of my work is of stoneware clay, high-fired in a gas reduction kiln.l. I exhibit through many fine galleries and juried craft shows. My work can be found in corporations and private collections both nationally and internationally. I have given workshops at Arrowmont School of Arts and Craft, Canton Clayworks, Jacksonville University in Florida, and the University of Maryland.